Handmade greetings cards always mean that little extra to the recipient than one you have bought from a shop. Taking the time to create it yourself helps show how much you care and that thought is appreciated. If you are an avid stitcher, like me, then mounting your work in a 3 fold aperture card is an ideal way of finishing off small projects. 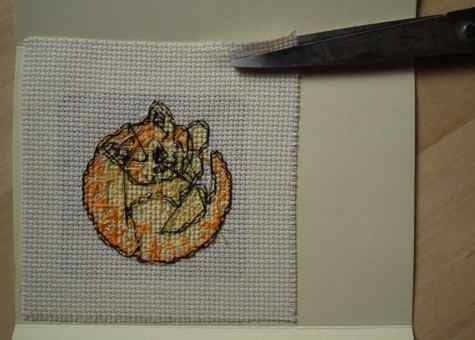 Choose an aperture shape that compliments the basic shape of your cross stitch design and ensure that the design you pick will fit within that shape. If it looks like being a tight fit, then you may want to consider stitching it on a embroidery fabric with a higher thread count, as this will mean the finished design is slightly smaller. Also give some consideration to the color of the card. Do you want it to blend or contrast with the stitched design? 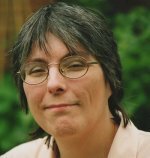 If you are creating a Christmas card you might like to pick a traditional red or green card whereas for a ladies birthday card you might prefer something softer and more subtle. Once you have picked the right aperture card, ensure you have a supply of double-sided tape , some sharp scissors, and enough room to do the job. 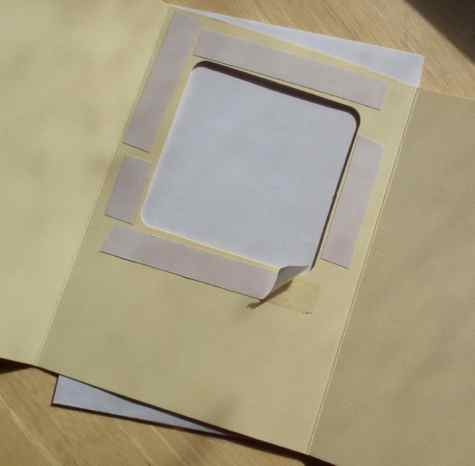 To ensure that your handmade greetings cards look their best it is important to attach double-sided tape all around the inside of the aperture, so that the fabric is held securely, without gaping. Then peel off the paper backing from the tape, exposing the sticky surface. Lay your embroidery on a flat surface, right side up. Then carefully lay the sticky side of the card on top, ensuring that the design is where you want it. 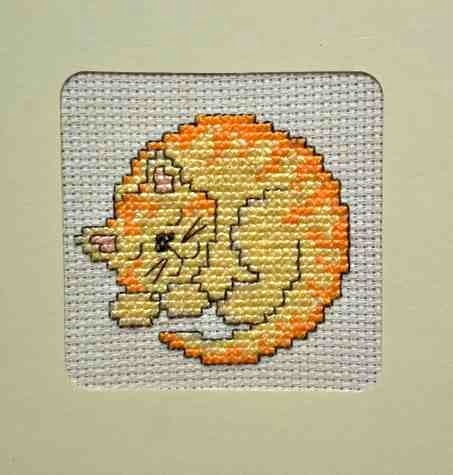 I like to leave a little extra headroom if the design is of a living creature, like the cat I am using in this example. Gently press the card down all around the aperture to make sure it is attached firmly. Then turn the work over. You may now find that the fabric overhangs, or is really close to, the fold line of the card. 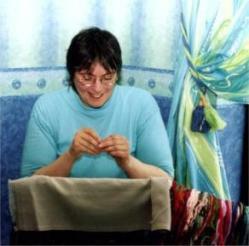 If so, just trim away a little of the fabric to ensure it fits comfortably. Next, attach double sided tape to the inside front of the card, around the outside edges, and peel off the paper backing. Fold the center panel of the card down over the taped one, and press firmly (with clean fingers!!) to ensure it sticks firmly all around. 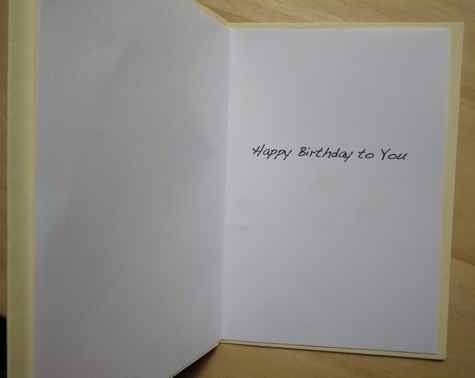 You can then either write your greeting directly on the inside of the card, or print off a greeting from your computer onto white paper and stick that down the center of the card with more double sided tape. I still like to handwrite a personal greeting on the inside of my handmade greetings cards underneath the printed wording. 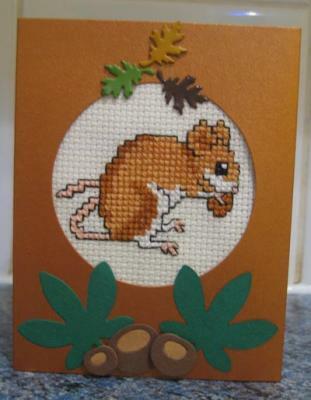 Lorraine mounted this little field mouse in an aperture card and then embellished it with leaves and acorns. Click to see more of her handmade cards. If you find it difficult to obtain three panel cards with an aperture you can use a single fold card and attach your stitching to the outside after fraying the edges. 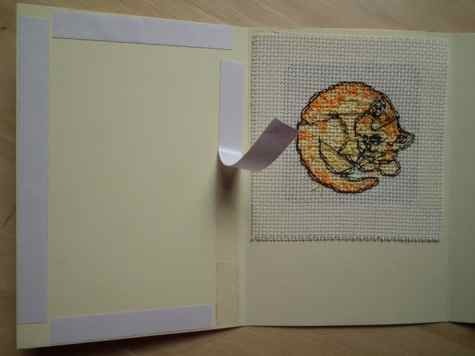 This time it can be easier to put the tape on the back of the stitching rather than directly on the front of the card. 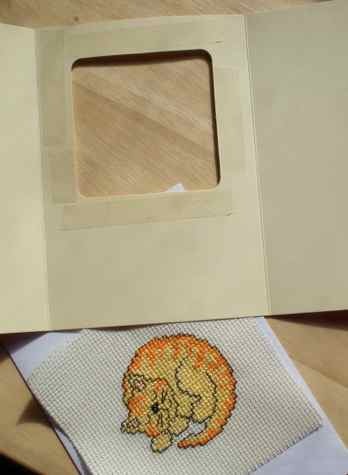 Try to position the stitched piece either straight, or deliberately "wonky" otherwise it can look as though you didn't take quite enough care.